Drones, UAVs, call them what you will, the impact of these remote controlled flying machines on the broadcast industry is growing steadily, with estimates being that around three quarters of the operators involved in the rapidly developing UAV sector in the UK are capturing images for marketing or broadcast purposes. And while drones are not likely to replace helicopters anytime soon — a vulnerability to wind and a comparatively short range and flying times being their headline limitations —they are becoming an increasingly important part of a producer’s toolkit. The growing ubiquity of drones has mirrored some rapid development of the multi-rotor systems over recent years, in part driven by technologies from other industries such as the cheap motion sensors developed for smartphone use. Mechanically they are simpler than single-rotor systems, more reliable and easier to fly, as well as having a larger lifting capacity (machines such as Intuitive Aerial’s Aerigon IAH3 being able to hoist a fairly hefty 9kg equipment payload). They are also becoming steadily more polished. While there is still a maker/hacker vibe clinging to the industry which is constantly looking to squeeze more power out of the onboard systems without sending the unit crashing to the ground, there is also a steadily growing army of capable off-the-shelf options available to the nascent flier. So what do you get out of the box? 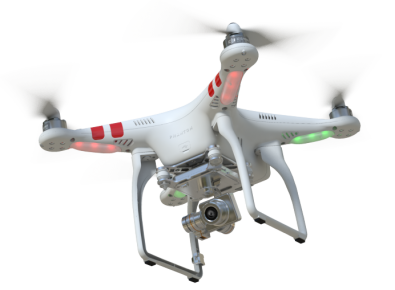 The DJI Phantom 2 quadcopter probably best exemplifies the low end of the market at the moment. For under £500 ($600) you get a machine that can fly for around 25 minutes, has been used in plenty of broadcast projects (including flying over an erupting Stromboli), and features various autopilot gizmos designed to stop it falling out of the air. It mounts the Go Pro Hero 3 via the H3-2D Zenmuse gimbal in an impressively easy set-up. The same company also does a hexa-rotor platform, dubbed Spreading Wings, which can carry loads up to 2.5kg and steps fliers up from the GoPro market. It also steps up the price too to around £2000 (you can pay more, you can pay less depending on model and spec), but happily once this mid-price range is reached the amount of choice on the market mushrooms. Spend a couple of grand and there are any number of competing machines available with four, six or eight rotor blade configurations, all of which can carry roughly the same weight and will keep you airborne for 15 to 20 minutes. Above this level machines start getting more capable and, while flight time remains fairly static, they add image stabilisation to the mix via a gimbal whose inbuilt server motors react quickly enough to damp down any image vibration. And finally at the very serious end of the spectrum—just under what are essentially mini helicopters like Flying-Cam’s SARAH 3.0, which filmed the opening bike chase over the roofs of Istanbul’s Grand Bazar for ‘Skyfall’with a Red Epic onboard—you have the likes of the Aerigon IAH3. This machine gained a certain amount of notoriety when it was marketed under its original name of Black Armoured Drone, but a less confrontational rebadging hasn’t diminished its specs: a six-rotor machine capable of 50kph shoots and carrying 9kg payloads up to 300m into the air and over 1km away (well beyond the legal flight envelope, in other words). At a starting price of $25,000 it’s not cheap, but if you want to be flying ARRI Alexas around the skies it’s always good to know that your camera choice is well supported. There is more to come at all levels too. Between DJI’s Phantoms I and II flight time doubled and progress is accelerating as the manufacturers look to tap into the high end of the hobbyist market. The next year or two is set to deliver improvements in flight time, lifting capacity and more in the way of automatic controls across the industry. The question lies in in how many people are going to get to use them for filming purposes. In the UK operators not only have to receive a Permission for Aerial Work from the Civil Aviation Authority if they are undertaking any sort of work ‘for valuable consideration’, but also abide by the rules of the CAA’s Cap 722 document (Unmanned Aircraft System Operations in UK Airspace –Guidance). within 50 metres of any person, vessel, vehicle or structure not under the control of the Remote Pilot; during take-off or landing, however, the aircraft must not be flown within 30 metres of any person, unless that person is under the control of the Remote Pilot. Indeed, Cap 722 has been refined five times since first publication in 2002 and with drone usage becoming more prevalent on productions, providing both impossible jib shots and aerial footage for a fraction of the price of a helicopter shoot, the chances are it will be overhauled again very soon. The only question really is, like a quadcopter in a sudden crosswind, which way will the legislation tilt? The US provides a clue. The FAA has a widely flouted blanket ban on the commercial use of drones for all but two oil companies operating in Alaska, and is now seriously late in delivering its own updated rules and regulations covering drone flights. However, at the end of September it suddenly eased its position, granting six movie and television production companies permission to use drones for filming, with (according to AP) “40 requests for exemptions from other commercial entities”in the works. Expect to see a lot more drone work, both obvious and subtle, in US productions and then percolating out through the rest of the industry where legality permits as a result.